The Low-Down: Who's Ready To Put Their Kids On a Driverless School Bus? 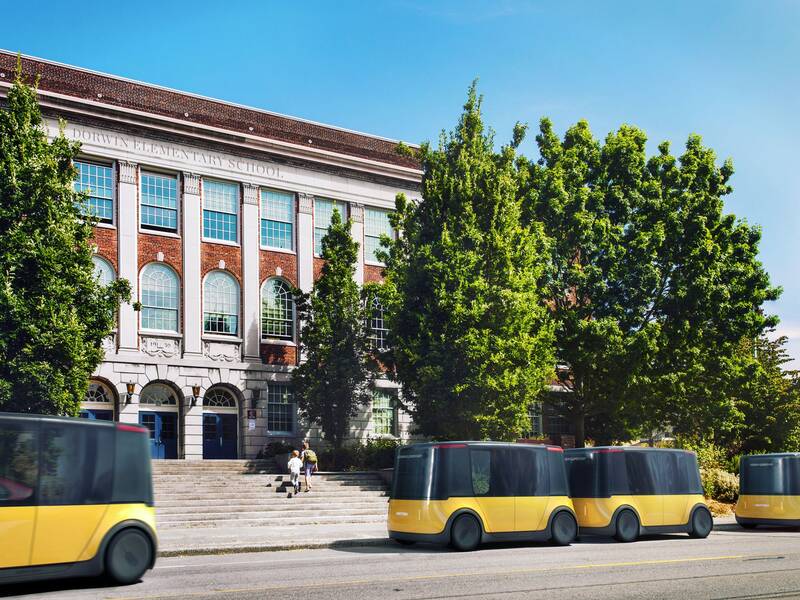 Who's Ready To Put Their Kids On a Driverless School Bus? For Milo's parents, there is good news and there is iffy news. 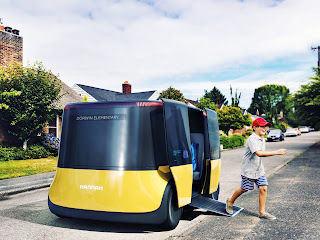 The good news is that they don’t have to cut babysitting checks for Hannah, because Hannah is a self-driving school bus. The iffy news is that Hannah self-driving school bus, a robot suddenly responsible for safely moving their child through traffic. design studio known for collaborations with Boeing and Nike. And the studio means Hannah to be a bit incendiary. The designers know the concept is provocative, but they think it points to a bigger truth: You’ll know autonomous vehicles are really here when parents feel comfortable putting their kids in them. That hasn't happened yet. A Pew Research Center survey conducted in May found 39 percent were very or somewhat enthusiastic about driverless vehicle development, while 53 percent were very or somewhat worried. AVs still make people nervous. “How you transport kids in the future, in an autonomous world, ends up being a proxy for trust in driverless vehicles in general,” says Devin Liddell, a principal brand strategist at Teague. School buses, it turns out, are often the slowest vehicles to adapt to new stuff. “Technology will typically come out on cars first and then roughly five years later, you’ll start to see commercial vehicles,” says Fred Andersky, who oversees marketing and government affairs for the automotive parts company Bendix Commercial Vehicle Systems, which works on commercial vehicles. “Then school buses tend to be 10-years plus.” Air disc brakes and stability control tech have only been available in school buses for the last few years, he says. Trucks have been using them for nearly a decade. There are a few good reasons for the lag. First, today’s school buses are already remarkably safe, thanks to a combination of vehicle design (rollover protection, protective seats, and high crush standards) and laws that afford special protection to school bus passengers. (It’s illegal, for example, to pass a school bus while it’s dropping off or picking up passengers.) The National Highway Traffic Safety Administration reports kids are 70 percent more likely to get to school safely if they hitch a ride on school bus instead of with mom or dad. Fewer than six American school-age children die inside school transportation vehicles each year. Add in the fact that school districts typically have to scrounge for funding anyway, and you’ve got bus tech that’s a few years behind. “Not that new technologies are outrageously expensive, but obviously with school districts you’re using taxpayer money,” says Andersky. “The basic argument is, we’re not having crashes. Why spend on technology?” In fact, kids are most at risk when they’re boarding or alighting buses, not when they’re riding them, according to federal data. That’s why the small Hannah concept would drop kids off right in front of their houses, so students wouldn't have to cross the street at all. The Teague designers say the pod’s small size lets it skip the traditional school bus stop and spoke-and-hub routing network. More and smaller vehicles could mean quicker and more convenient trips to and from school—not to mention later wake-up times—especially in less dense areas, like the suburbs. That's all way in the future, just like autonomous vehicles themselves. The stopgap solution toward a safer school bus would be simpler tech, like blindspot detection. While you can buy that sort of collision warning system on many new cars—and retrofit it onto old ones—that kind of heads up isn’t available in school buses yet. It likely won’t be for another few years, says Andersky. Then there's the people part of all this. Drivers don't just work the steering wheel and pedals. They're charged with monitoring the 50-odd, squirmy tykes for the durations of their trips, and liaising between demanding school districts and difficult parents. The median driver pay is under $30,000 a year, so no wonder nearly a quarter of school transportation companies say they face a "severe" driver shortage. Teague suggests that job could be better—even better paid—if the school bus driver becomes more of a fleet manager, monitoring multiple pods' worth of kids from afar as they motor toward class. "The school bus industry would be well-served to look at this," says Liddell. "While they might initially recoil at it, what does it mean for the next 10, 15 years of pupil transportation?" The design studio has no immediate plans to actually build Hannah, but it's fun to ponder, and think about additional details that need to be worked out. For example: Where would the cool kids sit on a bi-directional bus?